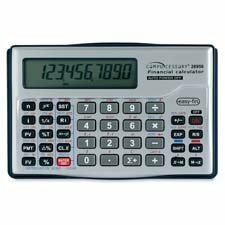 10-digit financial calculator is ideal for business, financial, statistical and time/data management. More than 120 built-in functions include TVM (loans and savings); amortization; bond price and yield to maturity; SL, DB, SOYD depreciation methods; register-based cash flow analysis NPV, IRR; memory for 20 cash flows; percent change and percent of total. Statistical functions include: standard deviation; mean; weighted mean; linear regression; forecasting; correlation coefficient; cumulative statistical analysis; total sigma; x; x 2; sigma y; y2; sigma xy; and logarithms. Calculator also features auto shutoff, date arithmetic and keystroke programming up to 99 steps. Calculator runs on a Maxell CR2032 battery.